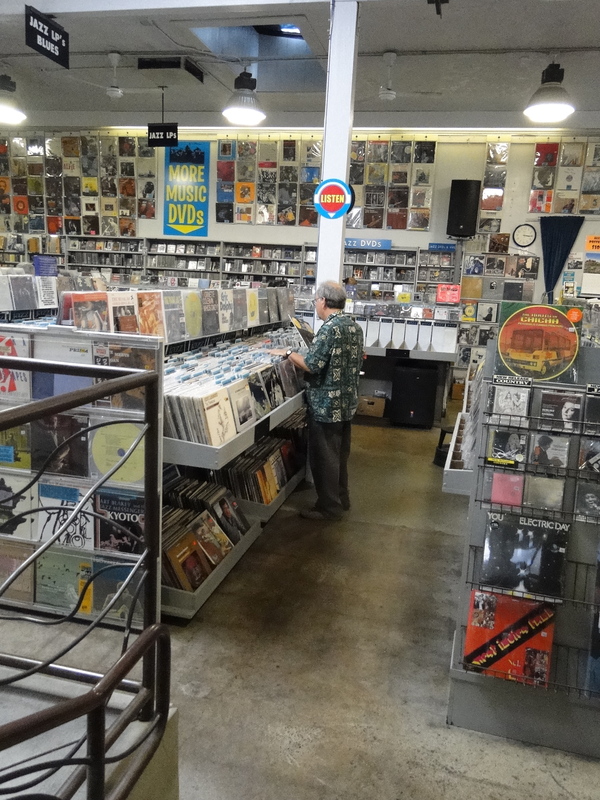 The Beloved and I have been savoring in our extended California holiday, and when we arrived near Berkeley, I said, quietly, “There’s a famous record store I want to go to. It’s called Amoeba Records.” She agreed; she encouraged me to do it early in the day. That’s what she’s like! It wasn’t the Arabian Nights, but I didn’t go away empty-handed. While I was rapt, silent, fascinated, the photographer Lorna Sass caught me unaware, a pilgrim on the jazz quest. The photograph shows how impressive Amoeba is — reminiscent of The Real Thing many of us knew so well in the pre-compact disc / download / online purchasing days. I am amused by the accurate likeness: my left hand is ready to move along the browser to the next possible purchase, while my right hand holds the Latest Object of Desire for consideration. The stance of the experienced record buyer, I think. What I am holding in my right hand indeed turned out to be A Prize: CHRISTL MOOD, a 1985 Phontastic Records session I’d never heard of featuring the Ellington trumpeter Willie Cook with “the young Swedes,” among them the magnificently swinging pianist Ulf Johannsson. $2.99 plus California sales tax, which is exactly what the new Hawaiian shirt (decorated with Japanese-style sketches of turtles and pineapples) cost a few days ago at Goodwill. And should you see me deep in contemplation at a record store, do come over and say Hello, although I might jump, startled, being so intensely involved in The Quest. This entry was posted in Generosities, Ideal Places, Jazz Titans, Pay Attention!, Swing You Cats!, The Heroes Among Us, The Real Thing, The Things We Love and tagged Amoeba Records, Berkeley, California, Goodwill, Jazz Lives, Lorna Sass, Michael Steinman, rare jazz records, Ulf Johansson, Willie Cook. Bookmark the permalink. Oh, I haven’t browsed like that in years and I miss it more than anyone can know. The slight mustiness … the intriguing cover art … the BARGAINS … the music of our lives … I hope that you more than satiated yourself with this opportunity, you lucky devil. By the way, do you you realize that these somewhat “incognito” photos of you are vaguely reminiscent of the Phantom Diner who used to do restaurant reviews in our area? Love the photo! And the details — Getz Meets Mulligan, Ahmed Abdul-Malik, Brown and Roach, Coltrane Jazz, Coleman, Dolphy, Mosaic’s Sarah Vaughan box, Horace Silver at the Vanguard . . . Ah, the old days! Michael, please tell me that just out of camera range, there’s a healthy selection of early jazz. If there’s room for Lorraine Hunt Lieberson singing Berlioz and Handel (in all seriousness, a gorgeous recording), there’s room for Bix.